Houston PD's chief has new approach to non-violent crimes. HOUSTON (KTRK) -- Houston's new police chief wants his officers to focus less on low-level offenses and more on crimes that affect the community. 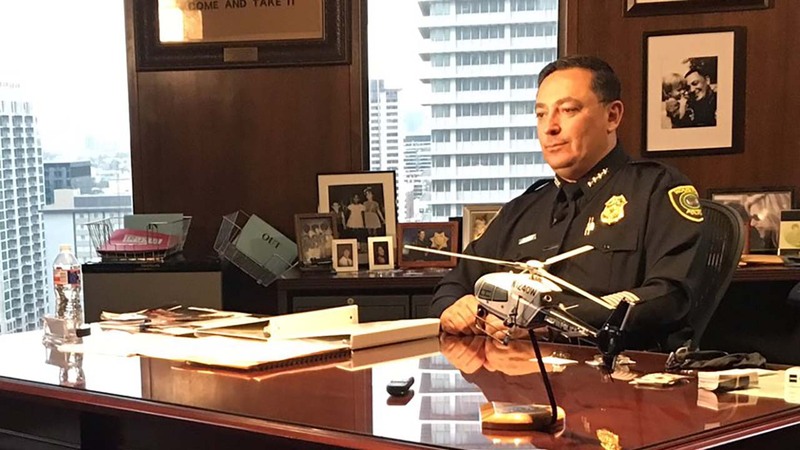 Chief Art Acevedo - on the job just a month - says he plans to propose a "cite and release" program for low-level, non-violent offenses, like petty theft or possession of four ounces or less of marijuana. He says officers would confiscate any drugs or evidence, write a ticket and then let the offender go. The program is in place in Austin where Acevedo was most recently the Chief of the Austin Police Department. "And they (officers) can go on with their day instead of wasting an hour or two in the jail trying to book somebody," said Chief Acevedo. "And more importantly it's going to free our folks up to focus on serious and non-violent crime. We have to prioritize like everybody else." The program would not come without making some changes, like establishing evidence drops for police officers at several locations around the city. Currently, there is only one, in downtown. "We're not opposed to something that streamlines the process," said Ray Hunt, Houston Police Officers Union President. "Anything that puts our officers on the streets is a plus for us." Acevedo says he has the support of Houston Mayor Sylvester Turner and incoming District Attorney Kim Ogg. "This is about trying to do more with less and when you're lean like we are, you have to set up processes that are efficient and effective," Acevedo added. Acevedo inherited a department that is hundreds of officers short. He hopes to have the program in place next year.